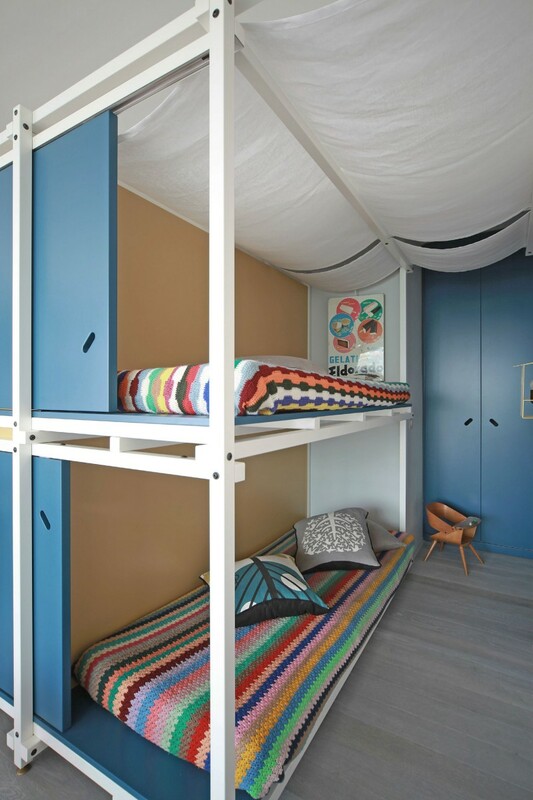 Fun House by Studio UdA is located in Antibes, France and was completed in 2012. 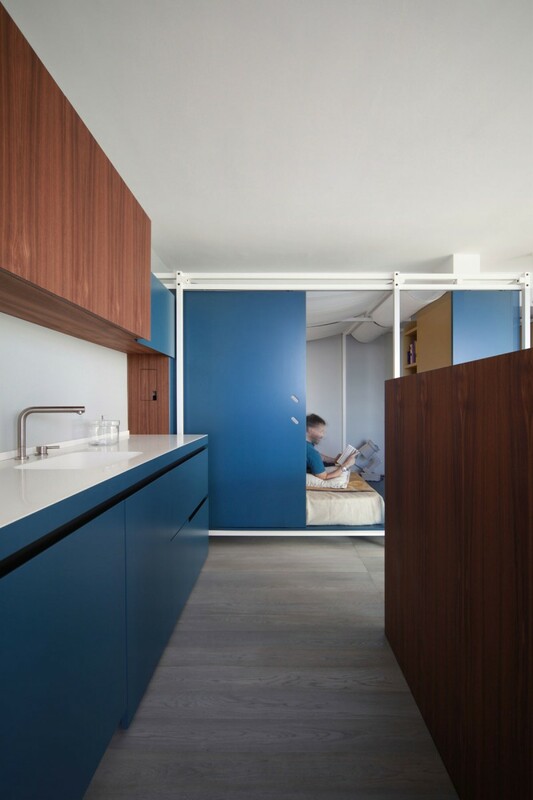 The main design challenge for the architect was to utilize the confines of the small apartment in order to realize its maximum potential. 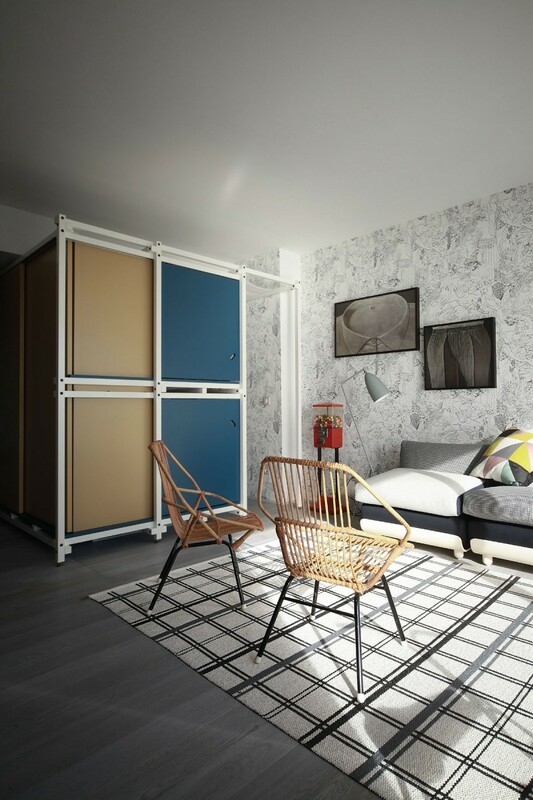 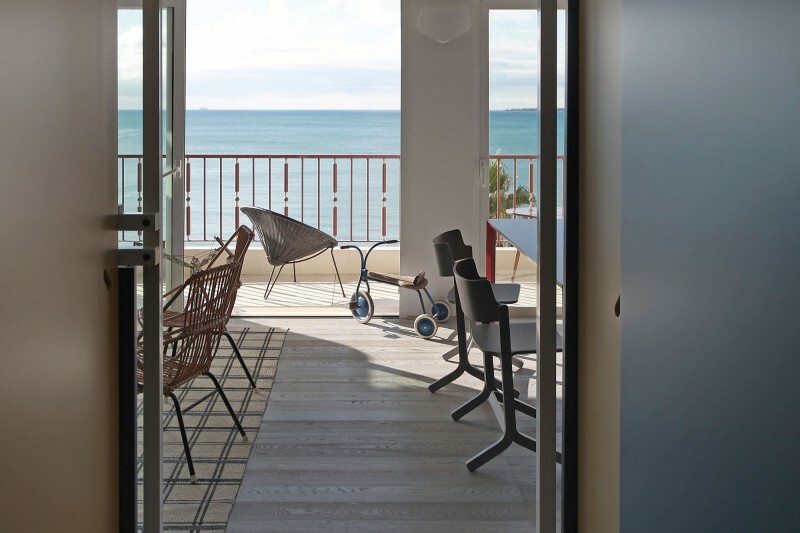 “The project for an apartment in Juan les Pins designed by Studio UdA developed by Andrea Marcante and Adelaide Testa tackles the issue of holiday homes. 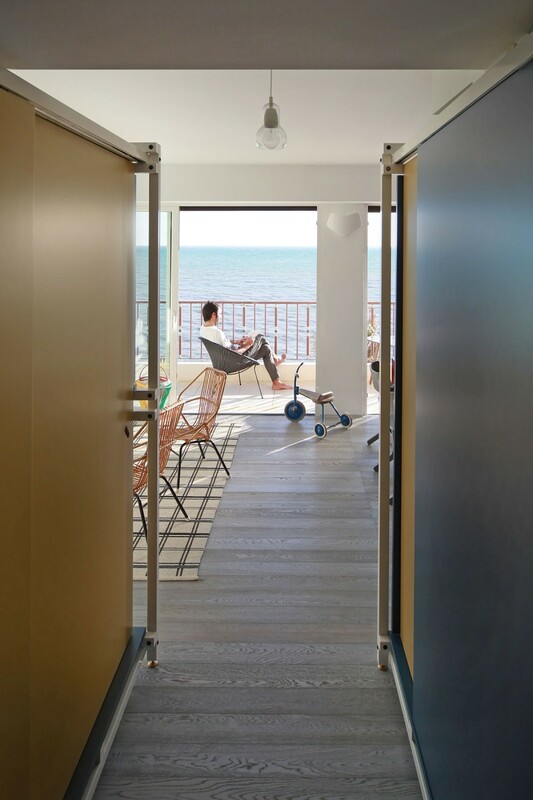 The small size of the apartments (40 m²), inside a building overlooking the sea that dates back to the 1960s/70s, provided the input for a study into various ways of setting out space and establishing interpersonal relations. 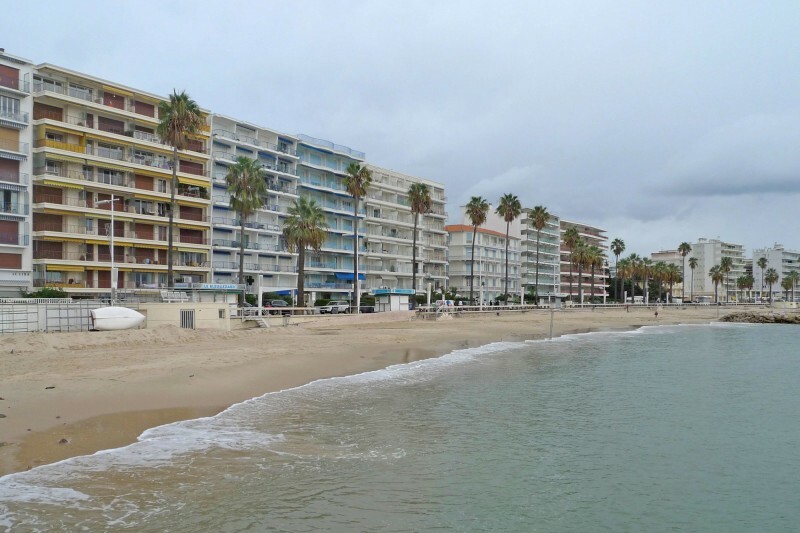 In this way, the decades in question and the communal life of Italian families on the beach in summer holiday locations constitute a sort of latent memory and one of the inspirations underscoring the project. 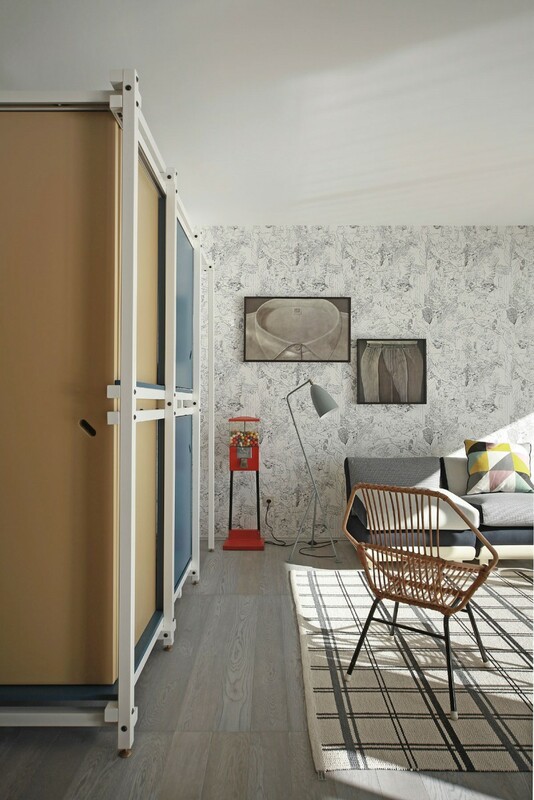 The beach and the momentary pleasure of a day at the seaside are merely evoked in the design, just like in a well-known Italian film from the 1970s: “Casotto” directed by Sergio Citti, in which the interior of a beach hut along the coast constitutes the entire setting for all the stories about different people related in the film. 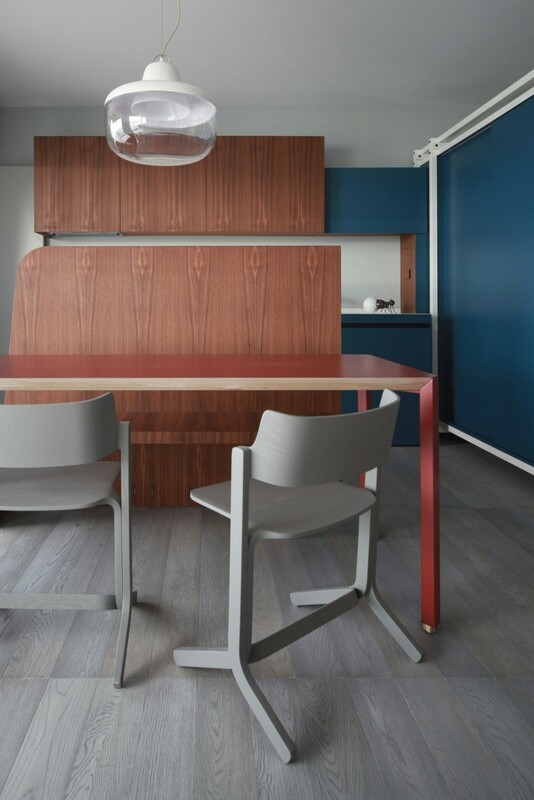 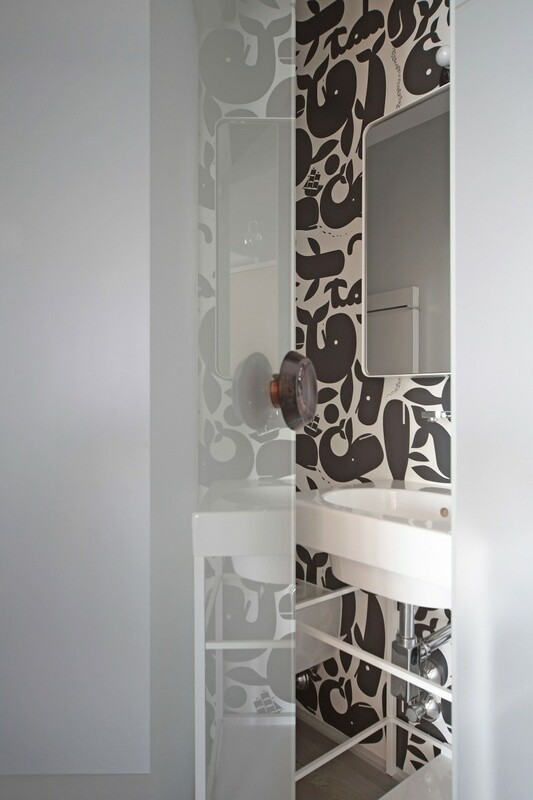 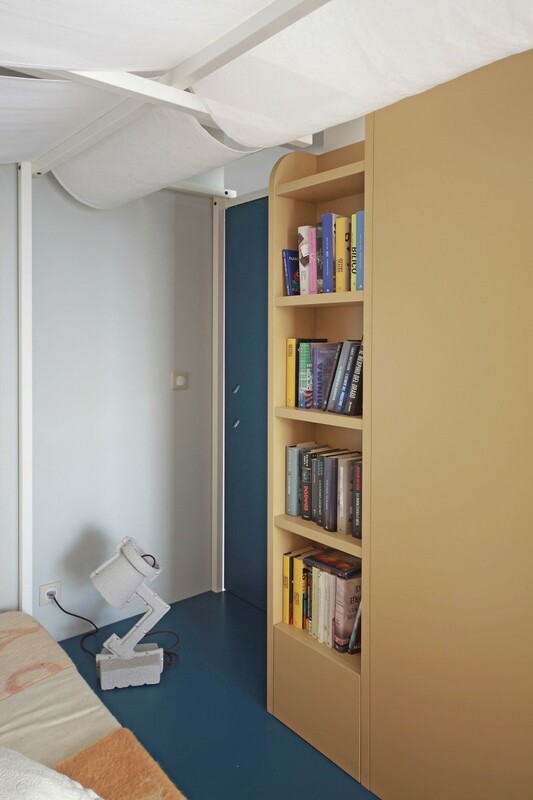 In the project designed by UdA it is micro-works of architecture made of metal and wood that generate unusual spatial relations between the people staying in the apartment. 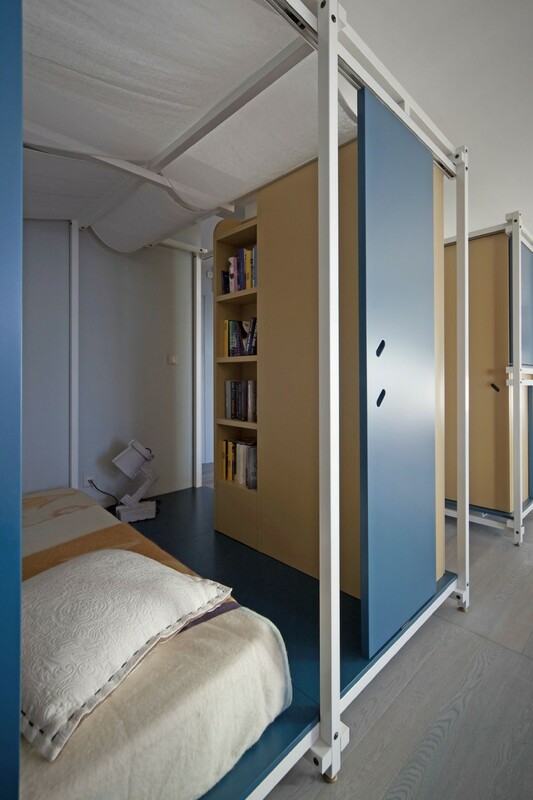 As well as managing to physically embody the different patterns of human relations during leisure time on holiday, the chosen design also met the client’s request to have a spacious lounge area and two separate sleeping quarters inside such a confined space, all with sea views. 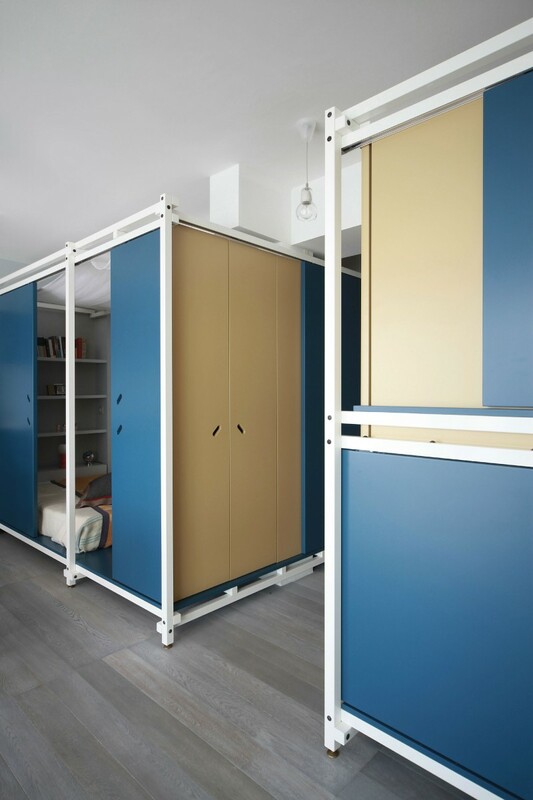 The reference to beach huts and self-built cabanas has led to the creation of lightweight structures inside the apartment; they are easy to assemble, relatively inexpensive and can also be set up according to the inhabitant’s taste and whims, while constantly offering views towards the outside. 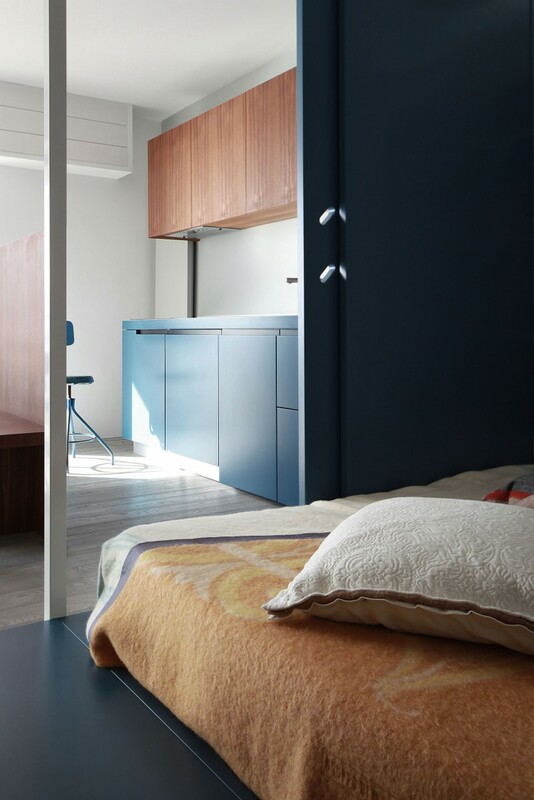 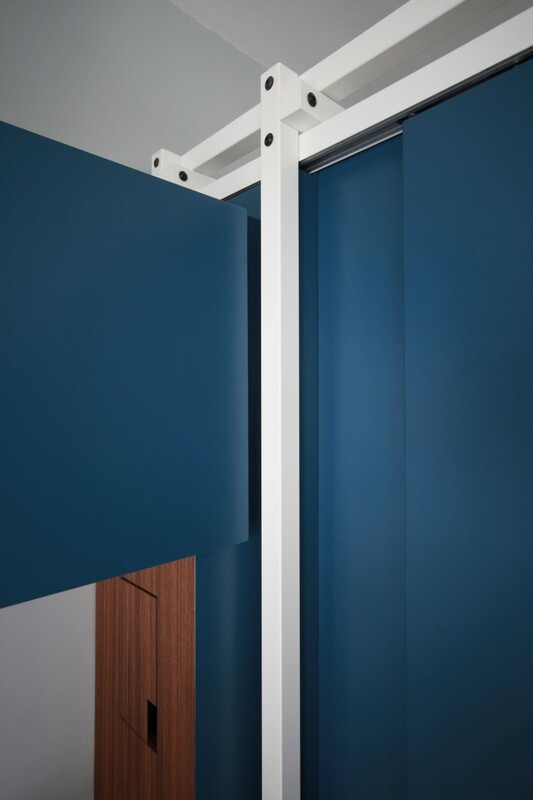 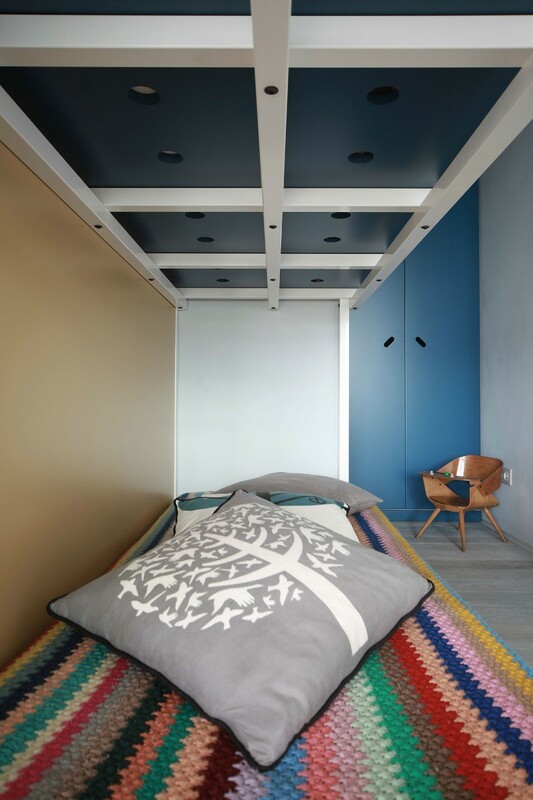 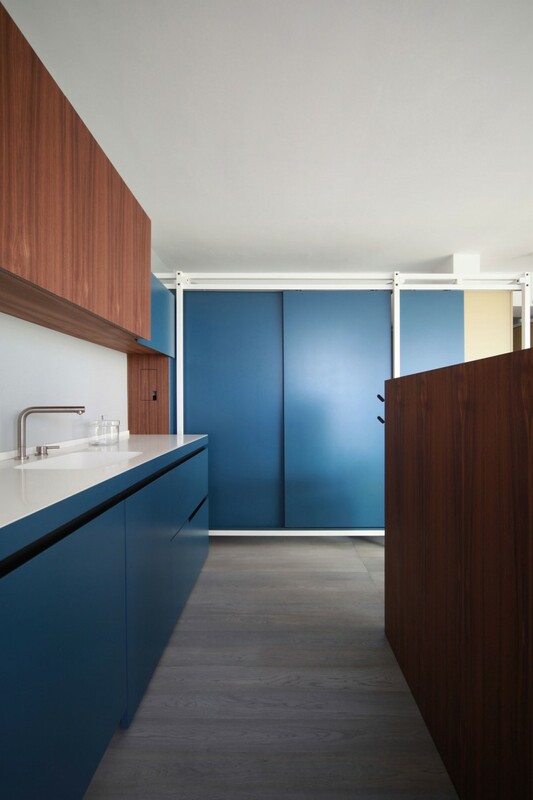 The colour schemes of nature are also reflected in the interior colours of the various partitions, whether they be sliding doors or built-in wardrobes. 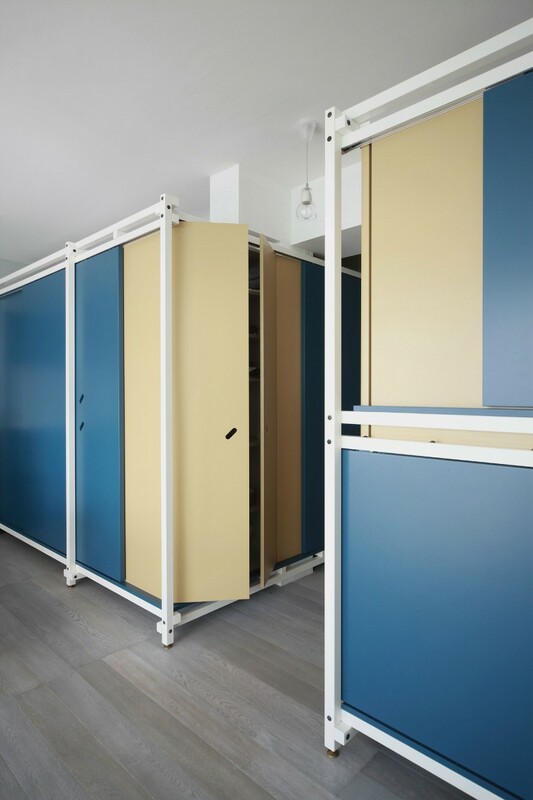 Just like life on the beach, the physical boundaries and cultural differences between people and the various activities they engage in are incorporated in the project: relaxation, children’s games and meal times are all reflected in different shades and tones. 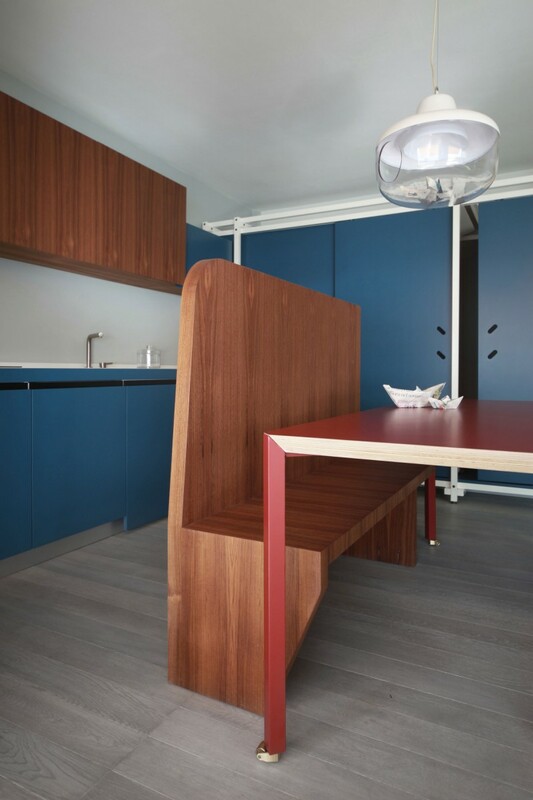 This enhances a sense of sharing inside the domestic space. 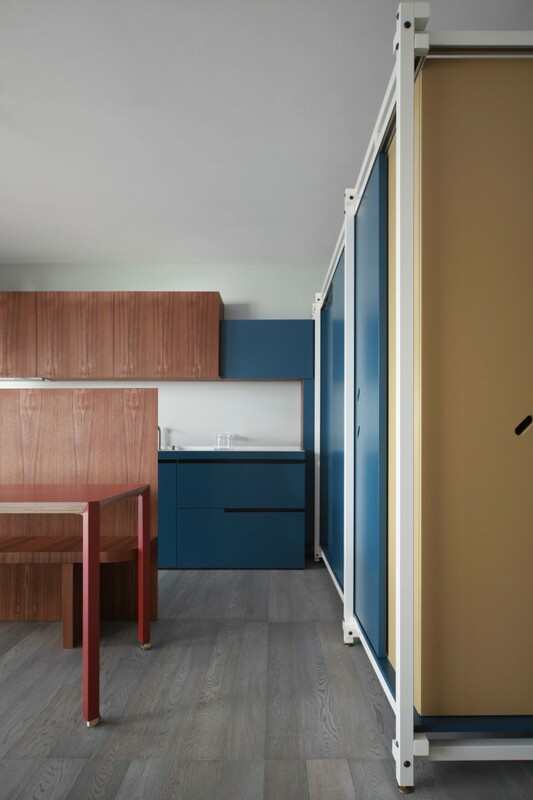 The stylistic languages used for setting out the spaces do not immediately distinguish the various functions of the elements into which the apartment is divided. 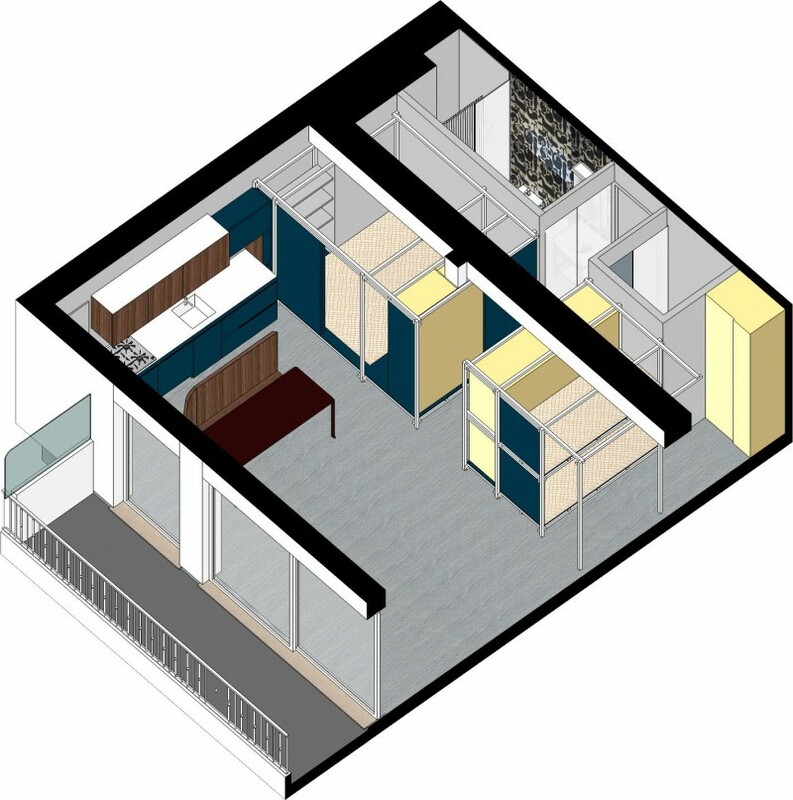 This enables conventional hierarchies between spaces and the people inhabiting them to be broken down, focusing on relations between the members of the family and people sharing vacation time together, just as is the case in the aforementioned film in which all the relations and stories involving the various characters take place inside the beach hut.